Live or camp Manchaug Pond? Join in solidarity with the Manchaug Pond Foundation in the lighting of the Manchaug Pond shoreline at 8:30 PM tonight, Sunday, September 3rd for the Labor Day weekend! This remains the last big weekend on the lake as children go back to school and the summer vacation season comes to an end. With flares, tiki torches, and campfires, light your waterfront, campsite and home showing solidarity with the Manchaug Pond Foundation to make a spectacular and safe end of the season. 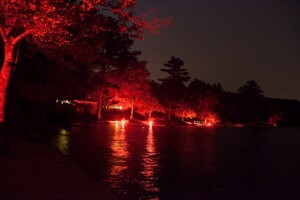 A long-standing tradition begun over 40 years ago to set the shoreline of Manchaug Pond aglow on the eves of July 4th and Labor Day. was suggested at the 1974 MPA Annual Meeting by member Professor Robert Nunnemacher after experiencing at a lake in New York and loving the effect. The MPA membership unanimously voted that day to bring the practice to Manchaug Pond where it has been a tradition ever since. If you didn’t get your flares at the August Annual Meeting, contact us to purchase or see a board member. Cost is $5./flare or 3 for $10. Both LED emergency and marine/road eco environmentally-safe flares are available. Manchaug Pond Foundation In. is a 501 (c)3 nonprofit public charity of volunteers dedicated to the welfare and correct use of Manchaug Pond and its watershed. In advocacy, education, and action, we work together preserving and promote water quality, the dam and waterlevel, watershed land conservation, native wildlife habitats, safe boating and more. All welcome to join the cause!